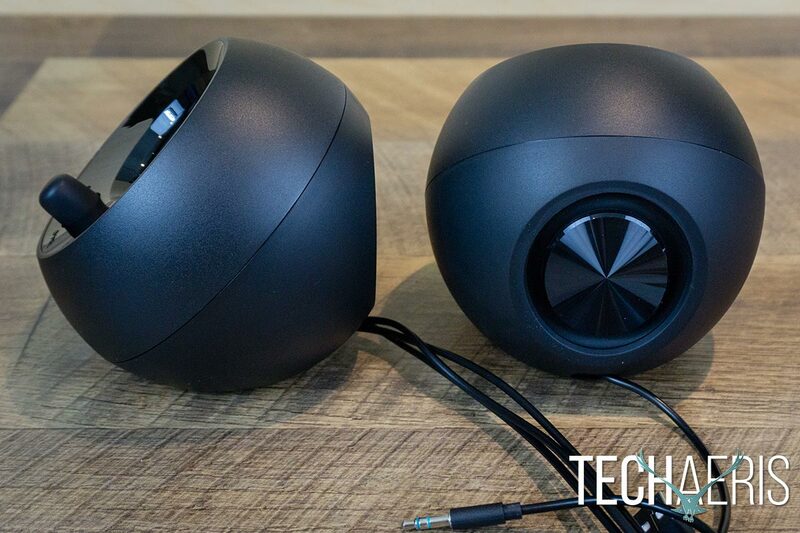 Like anything else, desktop speakers come in various shapes and sizes. 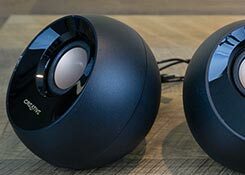 Our Creative Pebble review takes a look at a pair of “Modern 2.0 USB Desktop Speakers” from the longstanding desktop audio company. 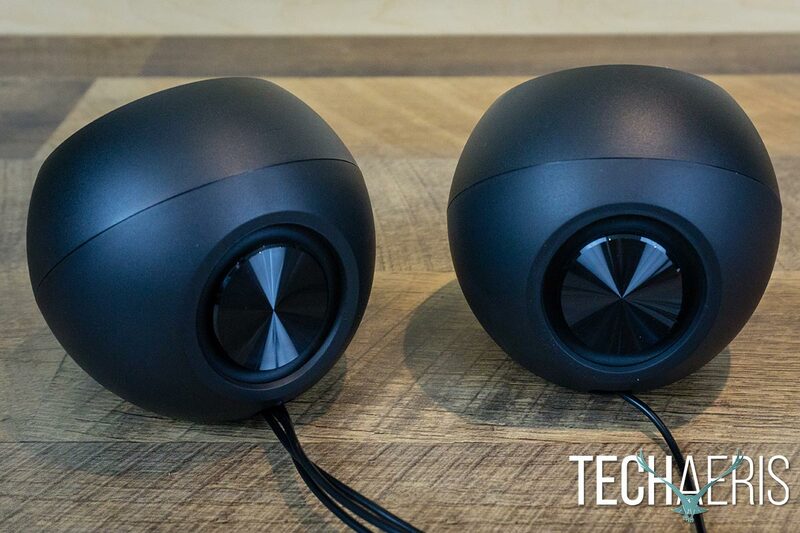 Read on to see how these orb-shaped, zen Japanese rock garden inspired speakers sound! The front of each speaker has a round tweeter in the upper two-thirds of the face which has a gold sticker in the middle. The gold ties in with the Creative logo on the bottom portion of the left speaker. On the right speaker is where you’ll find the power/volume knob beside a small green power LED indicator light. Underneath the knob is a small circle towards the left to indicate lower volume and a solid filled circle with the letters VOL beside it on the right for full volume. While the outer shell is a matte black, the inside of the front of each speaker is a glossy, more rubbery finish which easily attracts fingerprints. 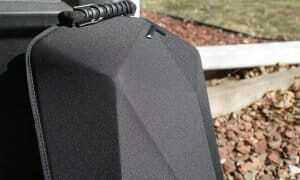 It does look nice though, it’s just something to be aware of when handling or moving the speakers around. The front of the Creative Pebble desktop speakers. 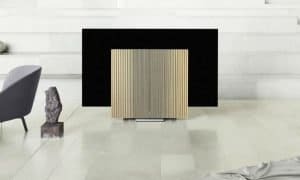 Turning the speakers around, the aforementioned flat component is where you’ll find an oval-shaped passive radiator on each one. Below this is a small (and easily missed) L or R to indicate left or right speaker. Near the bottom is a small cutout from which a single wire runs from the left speaker to the right and the USB and 3.5mm audio wires run out of the right speaker. The wires are plenty long with the left to right speaker wire running about 42″ in length and the USB and 3.5mm audio wires running about 48″ in length. Depending on your setup, this should be ample to comfortable place the speakers where you want them in relation to your computer and/or monitor. Back view of the Creative Pebble desktop speakers. The bottom of the speakers have an oval-shaped rubber ring as well which rests nicely on your desktop, preventing both scratches and errant sliding around. 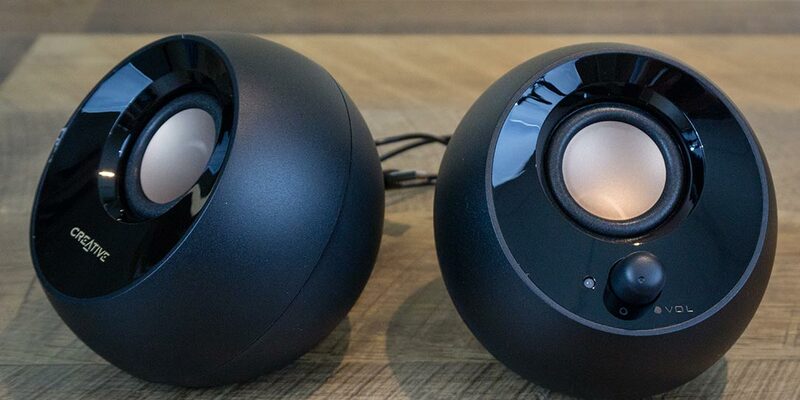 The Creative Pebble desktop speakers definitely have a low profile, modern look to them and they do look rather nice on your desk. 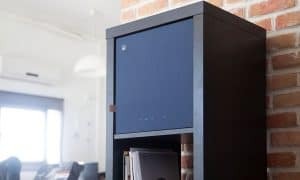 Desktop speakers, even the 2.0 variety, can be super simple or a bit more complicated to install depending on how many cables you have to connect and if they are externally powered or not. Thankfully, the Creative Pebble are of the former category and simply require that you plug the USB cable into an available USB port on your computer and the 3.5mm audio jack into your headphone out or green audio port on your computer. Once connected, turn the volume knob clockwise past the click to turn them on and adjust your volume accordingly. Being USB-powered, if you have limited ports on your laptop then you might need to get a bit creative. Fortunately, being USB-powered you can always plug them into a USB power adapter and power them off of that. The nice thing about that route is that you’re not taking up one of the few ports you may have on your computer (if that is an issue) but you can also use these with other devices that have a 3.5mm audio jack like portable music players or even your smartphone. If you’re like me, you generally stay away from cheaper desktop speakers because more often than not, the price you pay reflects the sound quality you get. 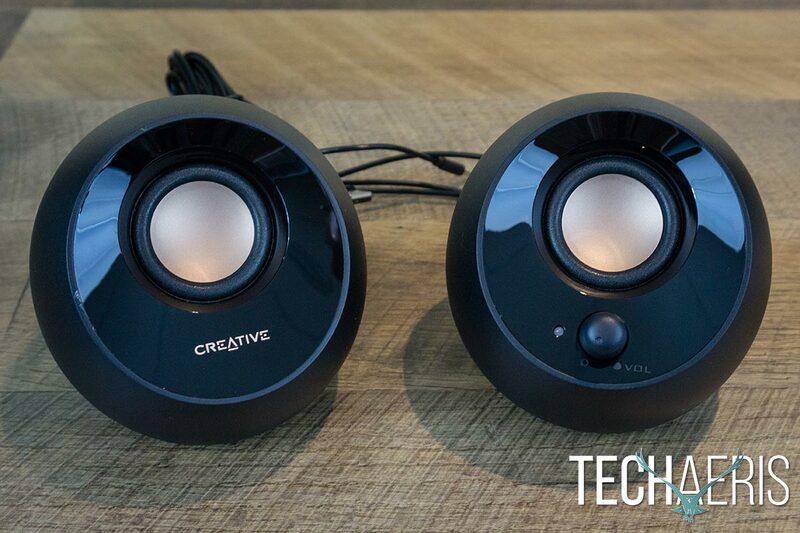 Fortunately, in this case, the Creative Pebble desktop speakers sound rather fantastic for a pair of 2.0 speakers. It helps that the 45º front design fires the audio up towards you instead of straight towards you. As well, the passive radiators add just the right amount of bass. The 45° design focuses sound up towards you instead of just straight out. As far as music is concerned, everything I put through these speakers from hip-hop to rock, EDM to dance, and classical to chill sounded great and relatively balanced. If anything, these may favour the low end a bit more than the highs but personally, I like that. Depending on what music you listen to, you can definitely feel the beat through your desk as well. That might be annoying to some but I rather like that side-effect as it pulls me into whatever music I’m listening to. 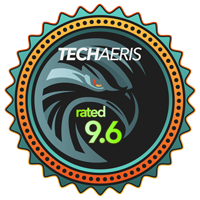 Of course, I had to try them out for gaming as well and I must say that they were pretty impressive on that front as well. Keeping in mind that these aren’t 5.1 surround speakers, you’re not going to be getting the full surround effect that can be helpful in some games. 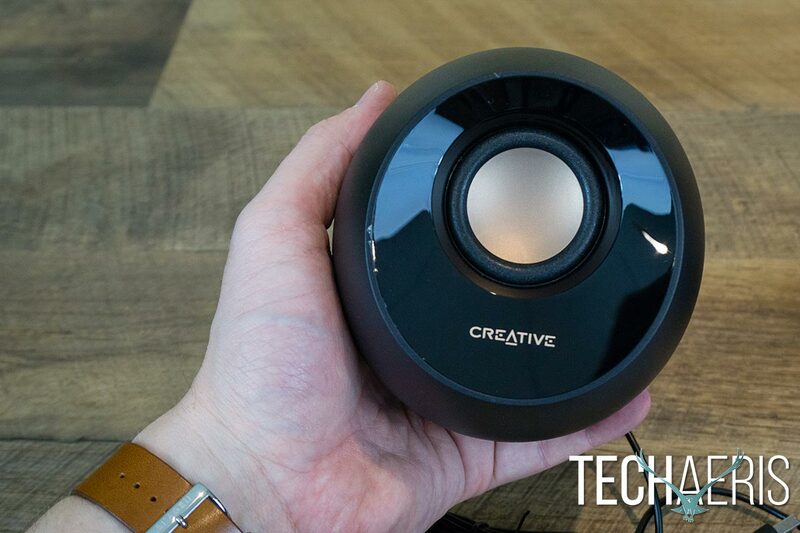 That being said, the Creative Pebble speakers were more than satisfactory for playing games like Heroes of the Storm and even Forza Motorsport 7 on the desktop. Simply put, the Creative Pebble desktop speakers had surprisingly decent sound for their size and will easily give you acceptable sound for your desktop computer or improve the sound coming from your laptop. Priced at $24.99USD, the Creative Pebble desktop speakers are very affordably priced, especially considering the sound quality they put out. These little speakers are definitely in impulse-buy territory. The Creative Pebble desktop speakers are nicely sized as well. *We were sent a sample of the Creative Pebble desktop speakers for the purposes of this review.